It’s the something annual May Fly Music Festival. Another reminder of why those-in-the-know call Northfield “Music City, Minnesota”. Two evenings of local favorites, playing music, down by the river, in downtown Northfield, MN. 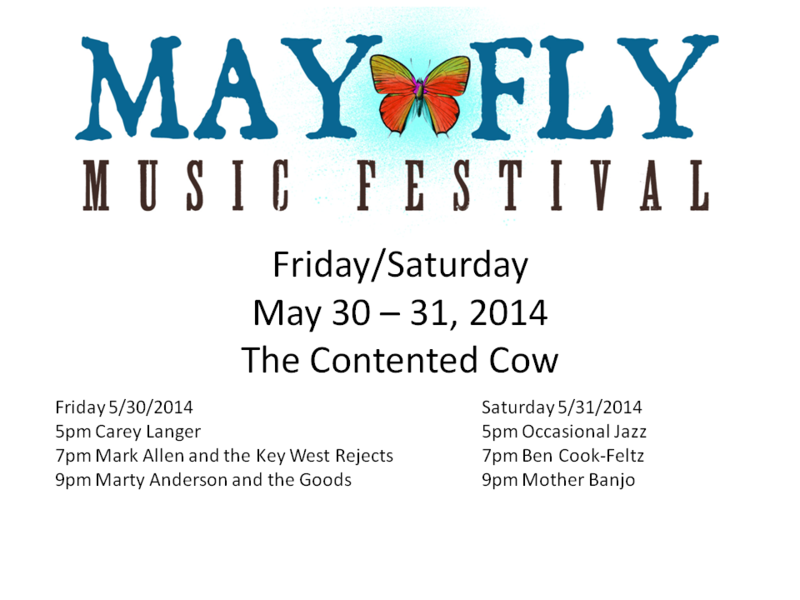 Friday, May 30th: May Fly Music Festival, featuring Carey Langer, Mark Allen and the Key West Rejects, and Marty Anderson & the Goods, 5:00 to 11:30 p.m., Contented Cow; Carleton Orchestra, 8:00 p.m., Concert Hall on the Carleton College campus; The Frye, 8:00 p.m., Tavern Lounge; and Room for Gray, 9:00 p.m. to 12:00 a.m., Froggy Bottoms. Saturday, May 31st: Free Admission Day, 10:00 a.m. to 7:00 p.m., Northfield Historical Society; May Fly Music Festival, featuring Occasional Jazz, Ben Cook-Feltz, and Mother Banjo, 5:00 p.m. to 10:30 p.m., Contented Cow; and Relativity, 8:00 p.m., Tavern Lounge. Sunday, June 1st: Quiz Night, 8:00 p.m., Contented Cow.